Mount Teide.....just an afternoon's stroll in the Canary Islands. 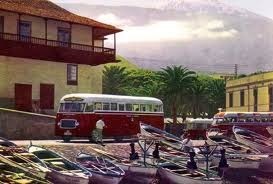 The Orotava Valley, on the island of Tenerife, awakened to a sunny day late in February 1963. It was a relief after such heavy rains and Mount Teide sparkled invitingly high above, showing off its finest costume. Business carried on as usual in the gentle and picturesque town of Puerto de la Cruz. However, there appeared to be a commotion that Tuesday morning at the Honorary British Vice-Consul’s office. A rather distressed, middle-aged English lady and a good looking young gentleman appeared to be having a heated discussion. They were led across the Spanish courtyard and up the magnificent wooden staircase to the first floor of what was known as La Casa Reid. That was where Noel Reid shared offices with his brother Rio. When Mr. Reid returned home late for lunch he explained to his wife that he had had a busy morning dealing with the case of a fellow Scotsman who appeared to have got lost on Mount Teide. The lady and her husband, Dr. Graham McPhee arrived at the Las Vegas Hotel in Puerto on Friday, 22nd February for a fortnight’s holiday. She recalled that as their aeroplane descended over Tenerife her husband spotted Mount Teide covered in a heavy blanket of snow and exclaimed, “I must climb that mountain!” She protested. He had promised to take her away to a warmer climate in order to recover from illness and she was so tired of mountains. “It’s just an afternoon’s stroll”, he replied. After all, George Graham McPhee was a well-known and accomplished mountaineer and he would be back in time for tea. Born and educated in Glasgow, he joined the Highland Light Infantry at the age of seventeen. He transferred to the Royal Flying Corps and was a pilot over France before being shot down and made prisoner in 1917. After the war he graduated at Glasgow University before finishing his medical studies in Vienna. But his heart was in challenging mountains and by the time he married Jean Craigie in 1930 this most attractive personality had climbed every peak in the United Kingdom. As his friend, Iain Ogilvie remarked in his obituary, “he possessed an incorrigible sense of fun and was at times outrageous”. 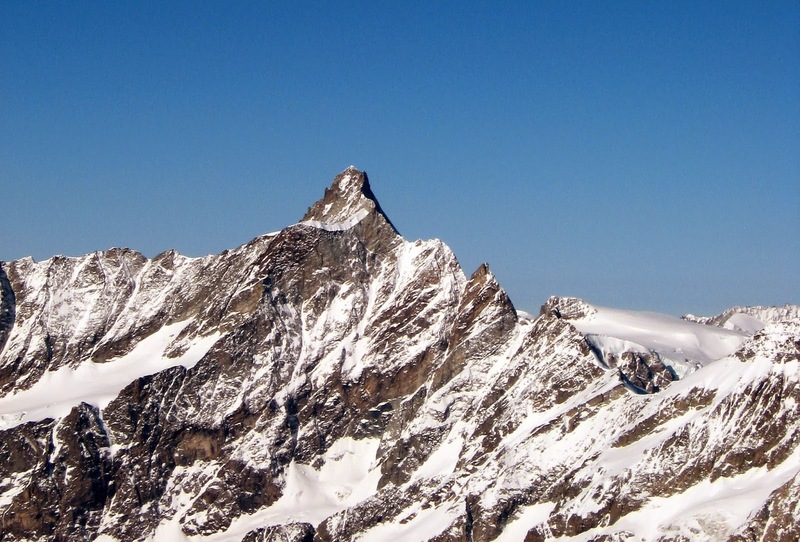 In fact his application to join the Alpine Club in 1934 would have failed had it been known that he had climbed the south face of the Aiguille Noir de Peuterée unaccompanied. He made eleven first ascents in the Swiss Alps in 1935 and climbed the same eleven 4,000m peaks, crossed the Zermatt mountains and spent seventeen hours on Le Dent d’Hérens when he was sixty. After returning to the climbers’ hut his colleagues were ready for bed, but he preferred the comfort of a hot bath and continued on his own in the blizzard to their hotel nine miles down the valley. After that feat, in a speech by a fellow mountaineer at a meeting of the Alpine Club, he was referred to as a remarkable old gentleman. He replied, rather angered by the description, "I am neither remarkable nor old!". There was no stopping this remarkable old gentleman.......except, it appears, his afternoon stroll on Tenerife’s peak. News of his death even reached Australia during the visit of Queen Elizabeth and the Duke of Edinburgh and on 4th March the Sidney Morning Herald reported “the body of Dr. George Graham McPhee, of Heversham, Westmorland, was found on Teide Mountain. 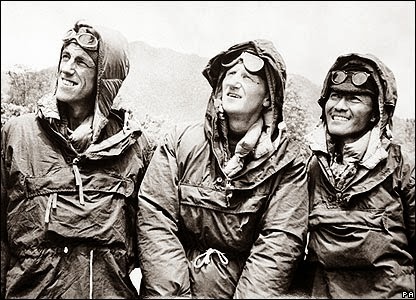 Lady Hunt, wife of mountaineer Sir John Hunt, made five lone ascents on the snow-covered mountain to search for her friend before hikers found his body”. In fact the hikers were local Canary Island guides. Lady Joy Hunt, who was accompanying the McPhees on the island holiday, had learnt to climb in the Himalayas with her husband, Sir John, of Everest fame. 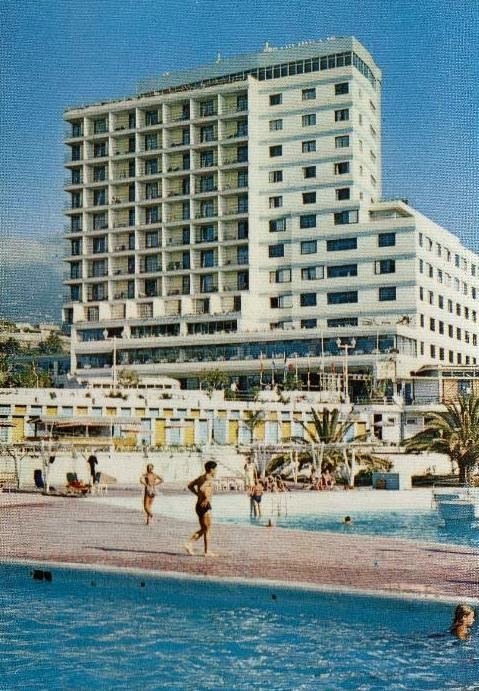 As far as an old diary can tell, the first thing Dr. McPhee did the day after arriving at the hotel in Puerto de la Cruz was to ask at the reception desk about the possibility of climbing Mount Teide. He was inspected as if he were quite mad. Nobody climbed the volcano at this time of year! It was the closed season. It was far too dangerous. Besides, the three young men who acted as guides for adventurous British visitors were not usually available at least until April. A young Italian tour representative overheard the conversation at the Las Vegas and intervened. He claimed to be an expert guide and said it would be a pleasure to take the sixty five year old Briton up the mountain. Another young English couple also joined the conversation at the reception desk and it was agreed the Italian would take them all up in to the mountains early the following morning in his own car. In their report to the British and Spanish authorities the Italian and the young English couple said they drove as far as the old Guardia Civil outpost which used to be close to the foot of the magnificent volcano. It was a beautiful Sunday morning, the snow sparkling in the warm sunshine, and they set off in spite of the guardias warning that it would be unwise to climb Teide because the sun and the wind had turned the snow into ice. Indeed, the English couple soon realised the climb was too much for them and suggested they all return to base. McPhee is said to have replied “If I make up my mind to do something I don’t give up when I meet difficulties”. The Italian guide also began to feel that he might have made a terrible mistake and tried to persuade the Briton to turn back. But the mountaineer was determined and the Italian was honourable enough to keep his word. So, while the other two returned to the car McPhee and his guide went on. When I was a twelve year old boy, before the cable car was installed to ferry visitors up the slopes of Mount Teide, I was invited to climb the volcano by a group of medical students from the University of La Laguna. They treated me like some kind of lucky mascot and I was given a piggyback ride on the last stretch when sulphurous fumes made me sick. 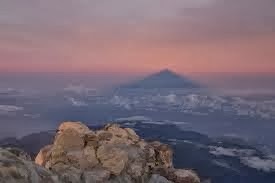 It was midsummer, there was no snow and we set off in the early evening to avoid the worst of the day’s heat and to capture the spectacular sight of Teide's shadow at sunrise. At dawn, on Teide's summit, looking at its own shadow as the sun rises. It was not a difficult climb for a fit person following the mule track to the Altavista refuge station three quarters of the way up, but the climb still took four hours. 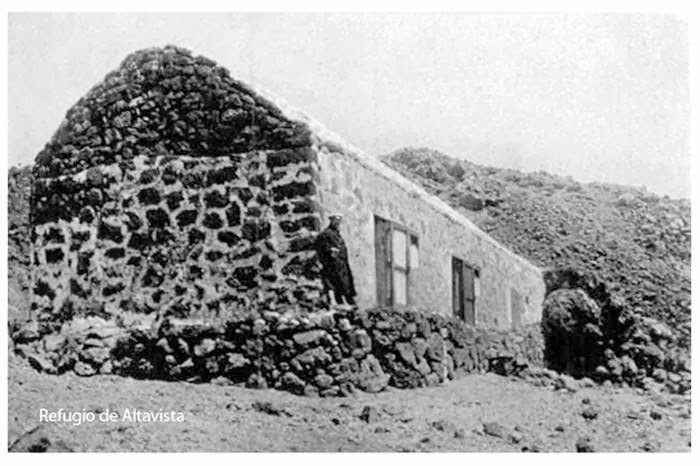 The original refuge, just a simple, volcanic stone wall to keep his instruments out of the wind, was erected by British astronomer Charles Piazzi Smyth. He spent sixty five days on Mount Teide in 1856. 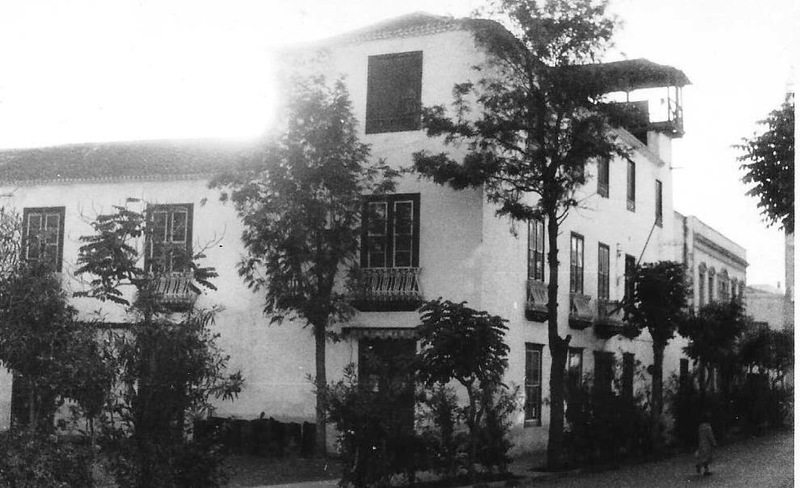 Another Englishman, George Graham-Toler, contracted the same builder who built the Anglican All Saints Church in Puerto de la Cruz to erect Altavista, providing proper habitable quarters in the 1890s. His idea was to offer climbers a place to rest and get used to the height, but he also charged a small sum to intrepid British visitors who wished to shelter for the night on the volcano with their mules. Dr. McPhee’s Italian guide described how they had gone to the refuge, not to rest but to leave their backpacks before tackling the summit. He insisted they had reached the top, where they took photographs inside the crater and of the spectacular view below them before starting their descent down the icy surface. McPhee began to complain of cramp in his legs and told the Italian to go down to Altavista ahead of him in order to retrieve their belongings. “I will follow you down and meet you at the bottom”, he told the young guide. When the Italian returned to the mule track he could not see the old climber coming down behind him and assumed he must have already gone down ahead. But when he reached the car he only found the young English couple waiting. They went to ask the Guardia Civil. No, the man they had warned against climbing the peak had not been. The group drove to the recently opened National Parador hotel further down in the island’s sunken Cañadas landcape where they waited until after dark. Eventually Jean McPhee asked to be taken back to Puerto de la Cruz. She was concerned, but quite accustomed to her husband altering course at the last minute if he met an interesting challenge high up on a mountain. It must have been a very sleepless night for the young Italian, however and he returned to climb the volcano again early the following morning in freezing conditions. He called and shouted all the way up and down, but there was no sign of McPhee. Dr. George Graham McPhee, a very determined character. It was only on the Tuesday morning that Mrs. McPhee decided to seek help at the Reids’ office and an immediate rescue operation was ordered. A spotter plane carried out continuous passes over the snow-covered slopes. The Guardia Civil searched the mountain day and night. They were joined by three local mountain guides and Lady Hunt who spent the next four and a half days combing Mount Teide. Even seventy one year old Noel Reid joined in. But it was futile and nobody will ever know if McPhee might have survived had his disappearance been reported immediately. He was an accomplished mountaineer, but not equipped on this occasion, wearing only plimsolls, for survival on the frozen slopes of a volcano at the height of 12,000 feet. The body was discovered a long way from the mule track he should have been following. It is thought he lost his footing while taking a photograph and slid for some considerable distance down the icy slopes. George Graham McPhee was buried in what was locally known as la cherche, or today as el cementerio inglés, the English cemetery in Puerto de la Cruz. The Guardia Civil confiscated the unfortunate Italian guide’s camera during their investigations. It seemed rather a cruel thing to do but to begin with Jean McPhee seemed reluctant to believe his account. Nevertheless, when his film and that in McPhee’s own camera were developed the photographs confirmed that both men had reached the summit. The Italian had been telling the truth. Perhaps they should have planted the Union Jack and il Tricolore on the rim of the crater. Later in the year Noel Reid received a package from Lady Hunt. It contained three woollen pullovers and three mountaineering ice picks. He was to hand them over to the three local mountain guides who had helped search for Dr. McPhee. Lady Hunt had been very impressed by the dedication, not only of the Guardia Civil police officers but also of the three local mountain guides. They had climbed the freezing Mount Teide for four days without any anoraks or warm clothing and wore only the local lona footwear, made from sacking material and rubber soles. McPhee, the expert British mountaineer, was not the first and he will not be the last victim to belittle Mount Teide, the dormant pride of Tenerife and the Canary Islands.